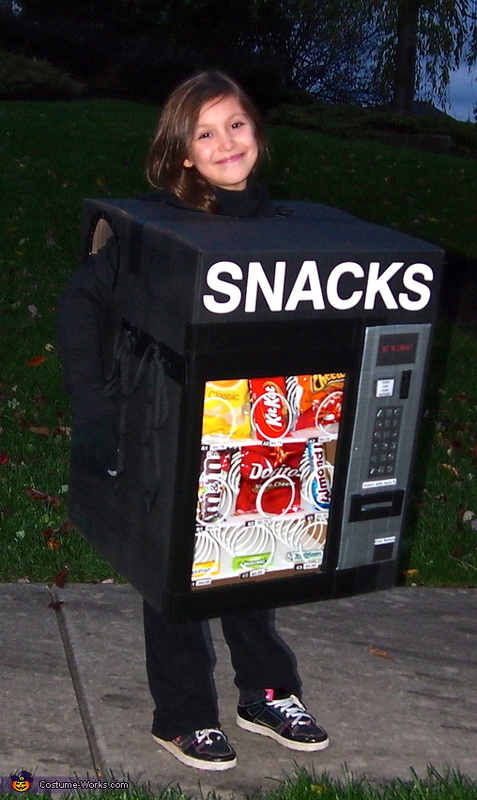 My 8 year old daughter is wearing the vending machine costume I made. I used a large U-Haul Box with a smaller U-Haul box inside to hold the snacks and plexiglass for the glass panel. I used plastic Slinkies as the candy holders and foam core as the shelves for the candy. I printed prices and signs on the computer and created the money and bill slots with cardboard and black duck tape. I attached the inner box to the outer box by making a ledge under the inner box and affixing the inner box to the outer box with black shoelaces on the sides. I hot glued the candy in place inside the Slinkies. The outside of the box was spray painted with matte black paint. My inspiration came from images of similar costumes made by others on the web. I then used images of real vending machines to add my own spin. Coolest halloween costume I ever saw!! !